Dimensions: 11 - 15 m of wide x 24 m of long. Materials: Stones, earth, branches of willows common, logs of chestnut, let us saw osier, young plants of ashes, seedling of dactyl, of white clover, of high fétuque, let us bouillées fragon, transplants of taken vegetables surroundings, produced by mowing. Participations: Arnaud, Nathalie, Noémie, Léobin and Bérénice de la Cotte; Michel the farmer who worked the soil, Giles Guérin for seeds, Luc and Fred for their helping hand, Matthieu and Martin helpers, Yoann Leclaire, Clement, the City council of Saint-Lumine which gave the permission to take a sample of some wood in hedges to the tile factory, Jean Martinet who allowed us to make some wood in the “wood of Saint-Aignan”, the garage Beillevere de Saint-Lumine for the transport of the small boat. Longue-vue-la-masure is an observatory of seasons, of time and of tides of the lake. With my first visit, I learnt to live in this place, discovering the alternation of two seasons defining himself by a high tide and a low tide, they regulated and still regulate local life: winter peach and summer pasture. The predominant winds of west bring to it the rain, projecting clouds enlivening the landscape by alternations of shadow and of light, from the west to the east, by successive waves on the home. Since the home they assist so the daily show of the sky and of the lands of opposite (Retardière, Mazelle, the Small Orchard, Branday); view becomes deep; 1,5 km are seen in more d 'and the plan of the sky answers the plan of the lake, in mirror. The architecture strong in the home was conceived in the axle is west as a kind of observatory of the landscape of the lake, like the eye (in cut), articulating the looked object, the course fulfilled by the garden and the room of the glass bais - glass mood ". The window pane works then as plan of the picture - the "cornea". The axle imposes so the order of look: a landscape which presents itself up to the solar blindness in the nice after summer midday. A fascination. But my fascination for this deep and broad space of the lake and of the sky comes undoubtedly from something less spectacular, from this connivance of the landscape forming a pocket here, with the eye which seems to find its place there, a receptacle.. So that this visual field was rather fulfilled, or underlined in the foreground by the surface which stretches of the bais glazed in the way which edges the ground on the West. 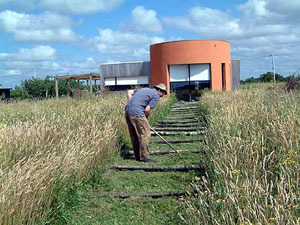 This west part of the ground is used as plastic space invested to make link with view on the lake and the picture window: call lake of the space by a line on the soil which supplements form, and a device of stocked elements divided in demarcation of this space (products of mowing, stony stacking up, wood) in reply to "Bouillées" of visible willows in the space-lake. My position wobbles then between an environmental intervention and a more "sculptural " intervention, the low sides acting as stubborn (as with fruiterers' existent hedge) where the absence of physical separation with the neighbour found a solution there to avoid the dispersion of attention: supervision, guidance of look by concentric progress (of the picture window in the rows of apple trees, then in the high hedges). A fitting follows from this logic of stacking up, just like tubes of long - view. The discreet buildings regulate the progress of a space which widens with view (opening of the visual field), to the point of suggesting in end of ground vaulted definite principle supposed to articulate visual system and bocagères hedges to embrace the form-pocket of the lake and of the sky. The central part remains rather low and homogeneous at first not to give stubborn in look, fétuque, dactyl and white clover, with a short part at the bottom, mown at the need The use of plantations, just like those existent in the landscape of the lake, organises discreetly the plastic space in reply to the group of willows in the space of the lake (a pronunciation forming an ellipse together). The progressive very staying, to reconsider every year, perhaps from season to the other one (changes are important enough).